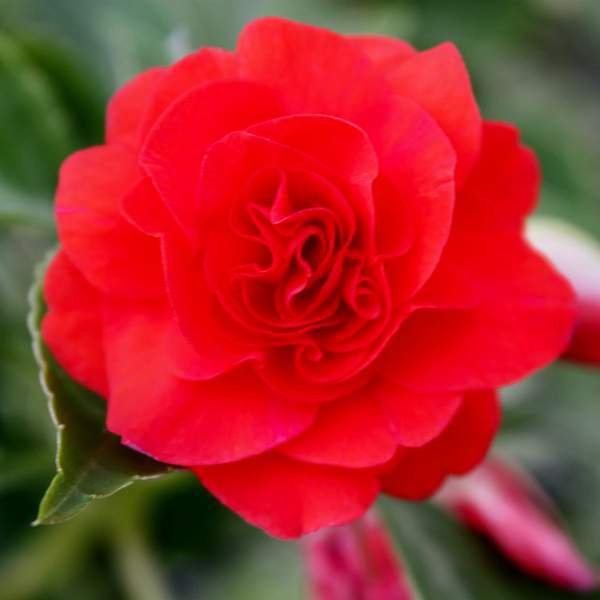 Double Impatiens have double (rosebud-type) flowers on plants that have been bred to grow full and compact. Originally from Africa and parts of Asia, the Impatiens genus is now widely found in the northern hemisphere. They are used as garden annuals, but they can also be planted in containers. Your customers may appreciate the fact they do not need a plant growth regulator to stay compact. For best results with Double Impatiens, we recommend using a well-drained soil with good water holding capacity. Use a well-balanced fertilizer at a constant feed of 150-200 ppm N. (Leach periodically with clear water to prevent salt accumulation.) Too high Ammonia levels will cause excessive vegetative growth and inhibit flowering. Too wet and un-aerated media will cause stretched plants and reduce flowering. Maintain a pH between 5.8 - 6.2. Double Impatiens have an excellent branching habit and do not require pinching. Double Impatiens should be spaced adequately to allow airflow and light penetration between the foliage. Usually 2’ centers on baskets will be enough. Maintain recommended light and temperature levels to avoid stretched plants and delayed flowering. Keep low levels of ammonia and avoid over-watering to prevent excessive growth and delayed flowering. Chemical growth regulators are usually not necessary; however, under low light intensities they might be advisable. Aphids, thrips, and mites are the primary pests attracted to Double Impatiens. Dark Red are not prone to many diseases, but watch for botrytis while the days are short. This grey rot is usually associated with wet or humid conditions. You can prevent botrytis by allowing the plant to dry out between waterings, allowing for good airflow in your greenhouse, and spacing to allow the sun to penetrate to the soil level. The most common chemicals used to treat botrytis are Medallion and Banrot. Use them as a drench according to each label’s instructions. We recommend planting 3-4 starter plants per 10 inch basket. Use a well-drained soil in your baskets and plant your starter plants deep, allowing the ellepot to be completely covered by the soil. If you are planting 4” pots, 1 plant per pot should be sufficient. Plant it directly in the middle of your pot.